The certified nursing assistant salary in Virginia according to indeed.com was estimated to be approximately $25,000, as on January 2015. Fortunately, these figures were 1% higher than the average income of CNAs’ nationwide. The statistics of the BLS indicated that the per hour and mean annual earnings were $11.63 and $24,190 respectively (as of May 2013). In the same year, around 37,360 CNAs were employed in VA, which signifies that employment per thousand jobs was 10.29. Nevertheless, these statistics fluctuate owing to a number of factors, such as employer, experience, etc. Annual income of 90% CNAs was less than $31,800; 10% were compensated more than $31,800. 75% of certified nurse assistants got less than $27,910; rest 25% got more than $27,910. 50% of the employees were salaried less than $23,380; 50% were paid an annual pay of more than $23,380. The annual wages of 25% of CNAs was below $20,260; 75% made more than $20,260. The paycheck of 10% of employees was less than $17,500; remaining 90% were offered more than $17,500. 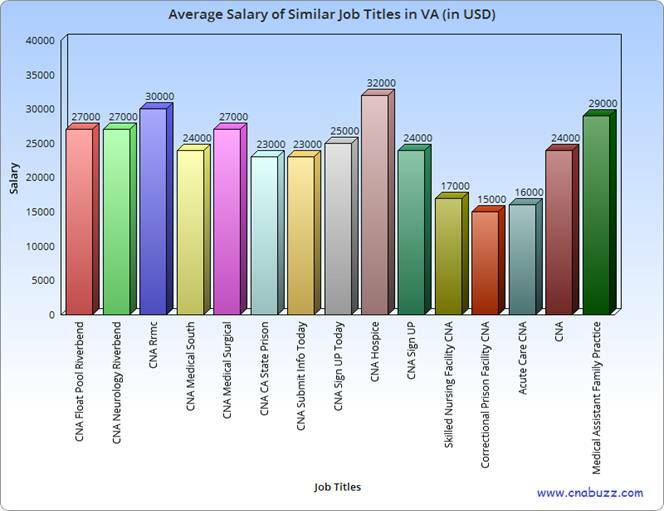 According to the salary.com, in January 2015, the cities, which provided the highest median annual salary of $33,932, include Alexandria, Annandale, Arlington, Reston and Centreville. These cities offered median monthly, weekly and hourly salary of $2,828, $653, and $16 respectively. Lynchburg was the lowest paying city with median annual, monthly, weekly, and hourly income of $27,222, $2,269, $524, and $13. The hourly salary in various cities of Virginia ranged from $13 to $16. There are a number of job designations in the nursing field. The position that a certified nursing assistant holds depends on the experience and education level. In addition, the salaries of these job titles also vary considerably. For instance, in January 2015, CNA Hospice was paid $32,000, while CNA Rrmc earned $30,000. The annual salary of CNA Float Pool Riverbend, CNA Neurology Riverbend and CNA Medical Surgical was $27,000. Correctional Prison Facility CNA was paid the lowest annual income of $15,000. The employment opportunities are increasing day-by-day in the healthcare industry and CNA is becoming the most prevalent entry-level positions across the country. Looking at the national statistics for upcoming jobs in this field, an optimistic picture for future certified nursing assistants can be seen, as a rise of 21 percent is expected in the years 2012 – 2022, according to the Bureau of Labor Statistics. 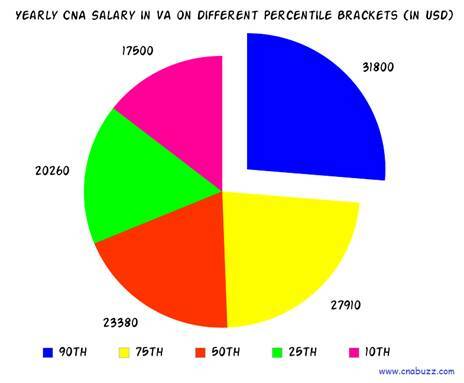 Question 1 – How much do certified nursing assistants earn in the state of Virginia? Answer – In VA, CNAs can expect an income of $25,000 per annum, according to indeed.com. Question 2 – Since the cost of living is a bit high in VA, what job title should I target? Answer – Like all other states, CNA Hospice is the highest paid job title with annual salary $32,000. Other top paid job titles include CNA Rrmc ($30,000), Medical Assistant Family Practice ($29,000), CNA Medical Surgical ($27,000), CNA Neurology Riverbend ($27,000), and CNA Float Pool Riverbend ($27,000).